Today, additive manufacturing is showing tremendous opportunities and ease in manufacturing complex parts. It has made possible for fabricators and CAD product design engineers to make 5 units of a particular design at one place and 100 at other. In a nutshell, additive manufacturing has removed the cap of parts produced to a considerable extent, and also paced up engineering time for fabrication. But even for a CAD driven fabricator, the rapidly increasing momentum of additive manufacturing is actually a concern. It is so, because fabrication drawings are in fact way too detailed and made for subtractive manufacturing. 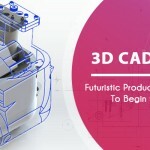 Their concern is because the time is gradually changing from pursuing CAD generated fabrication drawings to making CAD designs ready for additive manufacturing. Their legacy of CAD designs needs an upgrade. What happens to CAD designs when additive enters manufacturing? In order to fabricate the product exactly as per the customer requirements, fabricators ask design amendments. Engineering change orders are initiating every now and then from shop floor, owing to shortage of skill and settings. 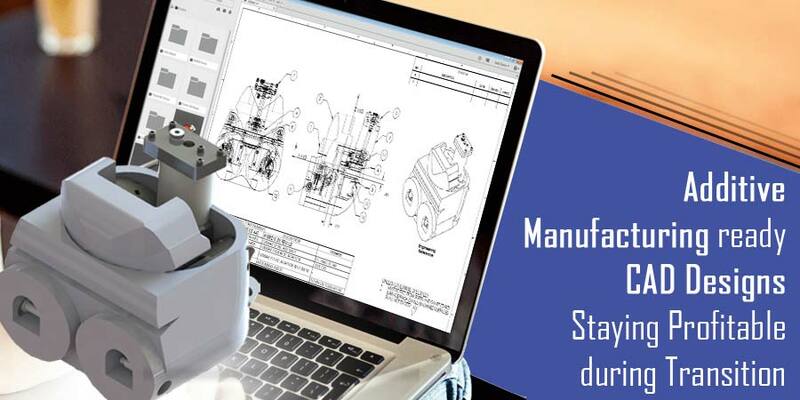 But with additive manufacturing in picture, designs can essentially be made exactly for manufacturing, leveraging the CAD technology and extending 3D CAD models. 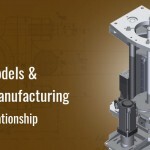 Fabrication industry along with CAD product design engineers has come a long way in exploring additive manufacturing with innovative designs and laudable achievement. But what is still needed, is a change in the legacy mindset of traditional design approach. It essentially needs the encouragement for shift of Design for Manufacturing to Design for Additive Manufacturing. It will essentially create design space while building intricate and customized parts. The new thinking is an extension of CAD designs to generative technology to streamline the product’s shape, weight and material, by retaining the structural integrity and design of the product. 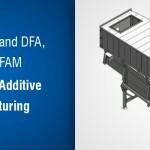 The way CAD design engineers have followed DFM rules and strategy, same way there are several unsaid, but universally practiced, rules for product and component designs following additive manufacturing approach. Like traditional manufacturing, the maximum part size is determined by the machine size and capacity. If the size exceeds machine capacity, and the end goal is only prototype, there are scaling options available which requires significant cleaning of 3D CAD model and editing as well. Very thin parts and walls will reduce the structural strength of the component and rigidity, particularly for undercuts and overhangs. Like in DFM guidelines, additive manufacturing too supports addition of ribs for strength. Minimum feature size such as blind or through holes, pockets, or protruding texts are all controlled by the additive manufacturing methods – be it SLS or FDM. 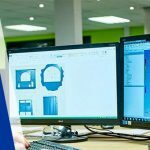 Looking at these most basic rules, and other guidelines, CAD design engineers are of the opinion that it all boils down to 3D CAD modeling. 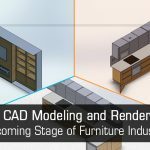 The fundamental level is strengthened by accurate 3D CAD modeling and converting them to STL files. To make the most, fabricators need to get their CAD designs additive manufacturing ready. What fabricators want from their design engineers is to have a 3D CAD model for additive manufacturing instead of annotating it with PMI as in subtractive manufacturing. An associate professor in one of the leading universities of USA coined the term of 4D printing. The professor suggests use of shape memory polymer fibers in composite material to transform a 3D object to another shape. When the world is gearing up to 4D, why are CAD driven fabricators hesitant in adopting and transfiguring their legacy?